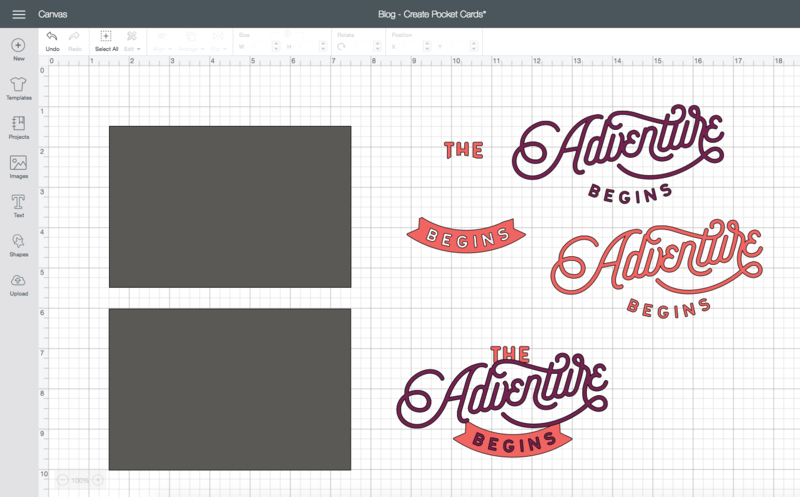 Are you ready for some new Cricut Design Space™ ideas? Today we’re going to walk you through creating your very own pocket cards for your pocket scrapbooking layouts. Making pocket cards is a great and relatively easy way to add unique shapes or titles to your memory keeping projects using images that can be manipulated in Design Space. Simply follow our steps below to learn how. 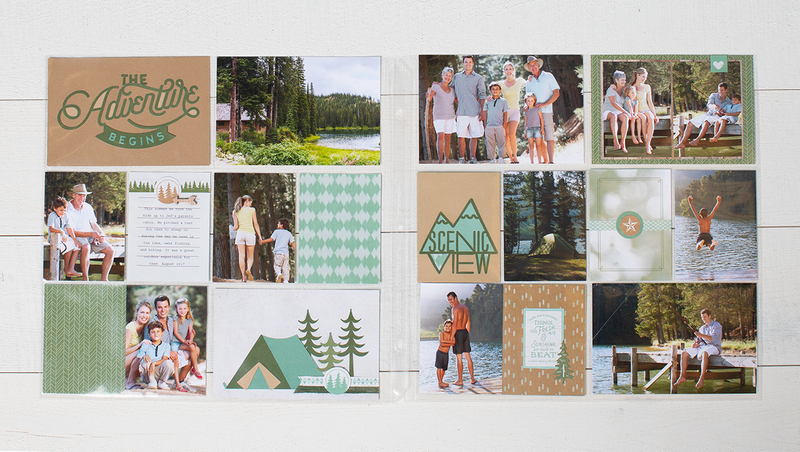 This layout shows three different pocket cards made with the You Are Here Cricut® collection. The variety of shapes from this travel-themed collection pair perfectly with the colors and patterns of the Fresh Air paper. These three pocket cards come together quickly when you use tools like Contour and Slice in Design Space. Let’s show you how to make the layered pieces for the title card, “THE Adventure BEGINS,” from one image in Design Space. The steps below show you how to work in Design Space from a desktop or laptop computer. If you use the app on a mobile device, the buttons and tools will be located in slightly different places on your screen, but the same features are available on any device. 1. 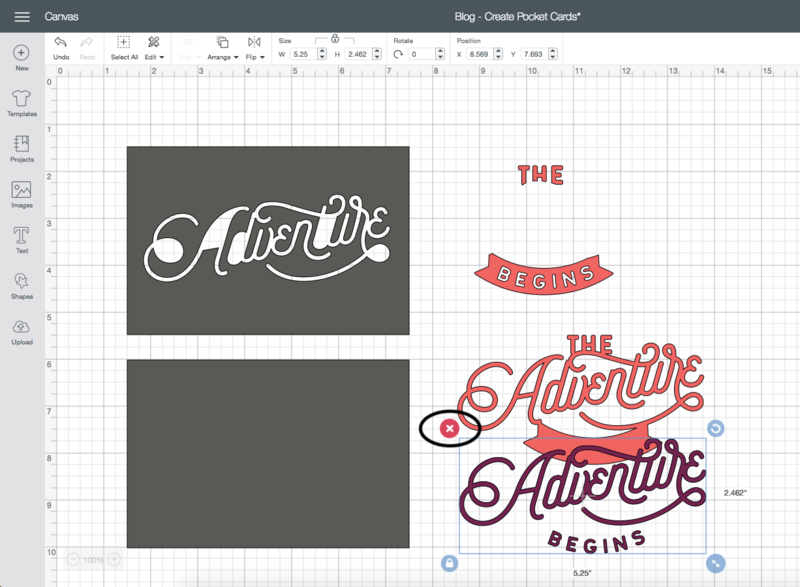 Sign in to Cricut Design Space™ at design.cricut.com. 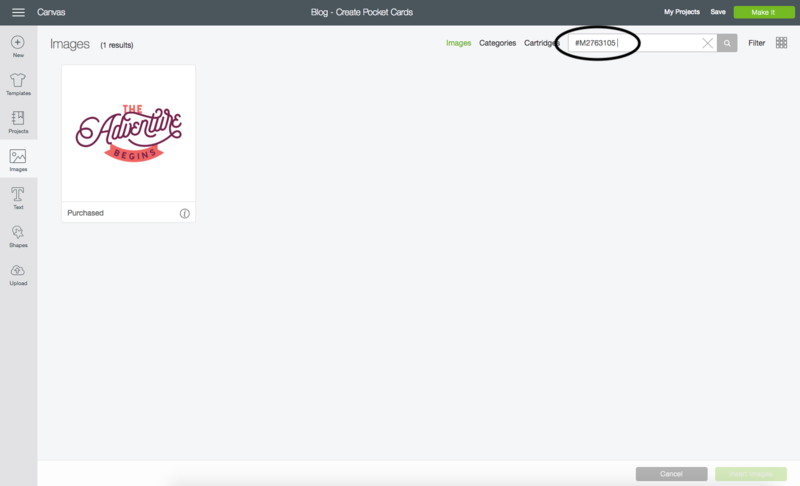 Log in with your Cricut ID and password, and then select the green New Project button in the top right corner. 2. 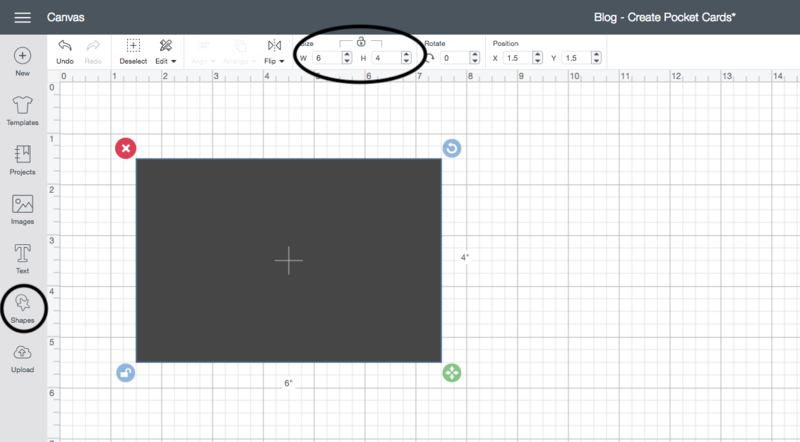 Insert and resize a basic square shape. To make the pocket card base, you will first insert a square by clicking on Shapes on the left side of your screen. Next you can easily resize this square to a 4″ x 6″ rectangle. Click the lock to unlock the size and change the width to 6″ and the height to 4″. 3. Insert the title image and resize. To add the title from the You Are Here collection to your canvas, click Images on the left side of your screen. Then search for image #M2763105 in the search box at the top. This is the exact title you need. Select it and click Insert Images in the bottom right corner to add it to your canvas. Then change the width only to 5.25″. Design Space™ automatically resizes the height to the correct proportions as long as the lock icon above the size is locked. 4. Duplicate the rectangle and title. To create this pocket card, you will need several images to slice and contour. To duplicate both the rectangle and the title, select the image and then click Duplicate in the Layers panel. The second rectangle will serve as the base for your pocket card. 5. 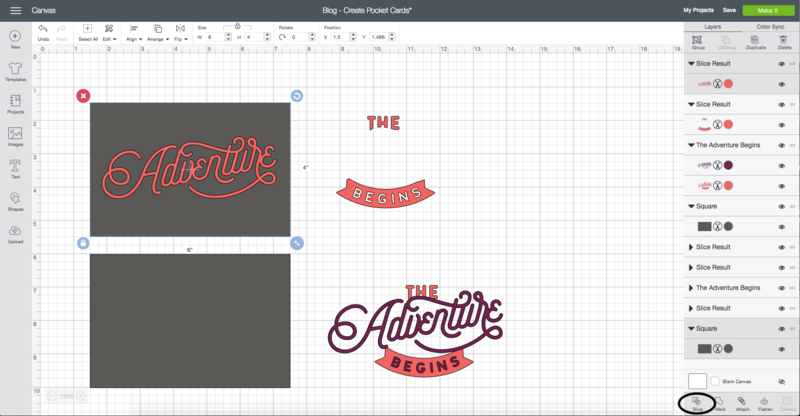 Without ungrouping, use the Slice tool on one of your title images. To slice the title, select it and then click “Slice” in the bottom right corner. This will help you create one of the layers on your pocket card. After slicing your first title, you’ll have several pieces of text remaining. 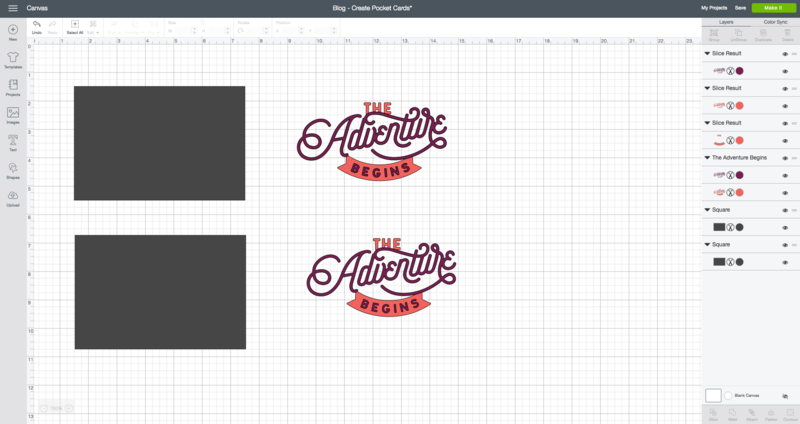 The screenshot shows you the three different pieces that will be made after you use slice on this first title image. 6. Delete one of the extra titles. Delete of one of the extra titles by selecting the red X. Make sure you leave the image with the words “THE” and “BEGINS” on your canvas. 7. Contour the remaining sliced title. 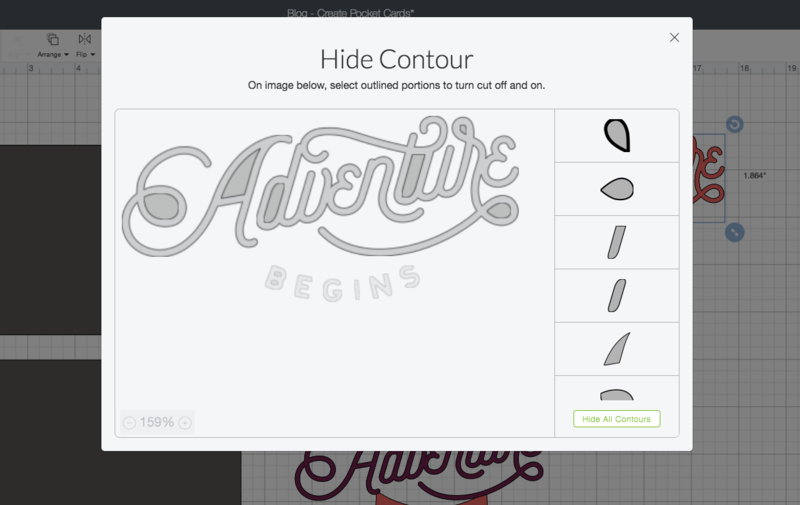 With the remaining title image from your slice, you will use Contour to hide the word “BEGINS” from the image to leave only the word “Adventure.” Select it and then click Contour in the bottom right corner. Then click on all the pieces you want to hide to get ride of the word “BEGINS.” This will leave only the word “Adventure” that you’ll use in the next step. 8. Use Slice to cut title into one rectangle. 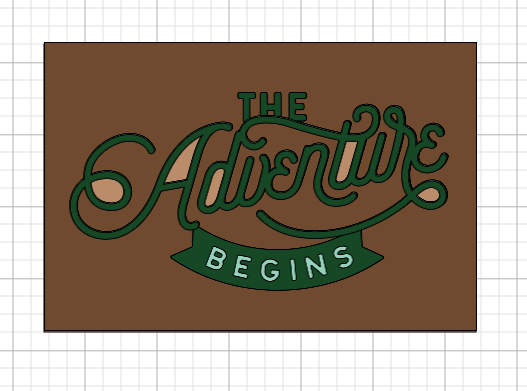 To cut the “Adventure” title into one of the rectangles, click and drag your mouse over the banner and text to highlight both images. This will allow the Slice option to become available in the bottom right corner. Click Slice. 9. Delete extra text and contour the title. Both titles from slicing into your rectangle can be deleted by selecting the text and clicking the red X. You won’t need to use them to build your pocket card. To allow parts of the solid cardstock to show beneath title you sliced in this pocket card, use the Contour tool to remove some of the extra cuts. 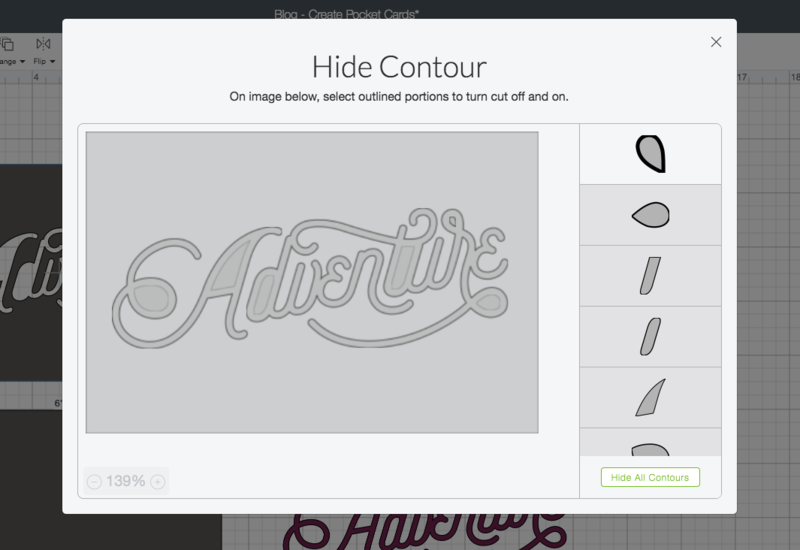 Select the sliced title and click Contour. Then select some of the inside pieces to remove, like the inside cut of the letters “A,” “d,” and “u.” You can also contour part of the curly line at the beginning and the end of the word. 10. Ungroup the duplicate title image and delete extra pieces. To create Juniper layer of this title, select the duplicate title and click Ungroup in the layers panel. Then delete the purple “Adventure BEGINS” image by select the red X. 11. Assign colors to your project pieces. Assigning colors to your pieces is an optional step, but it can help you see what color of cardstock you need when you cut your project. You can also color each piece and move them around to visually get a sense for how your project pieces will look when they come together, like we did below. 12. Cut your project and assemble your pocket card! When you’re ready, click the green Make It button in the top right corner and follow the prompts. We used light Toffee cardstock for the pocket card base and Toffee cardstock for the 4″ x 6″ sliced title card. We used Juniper cardstock for the title piece with the solid banner. 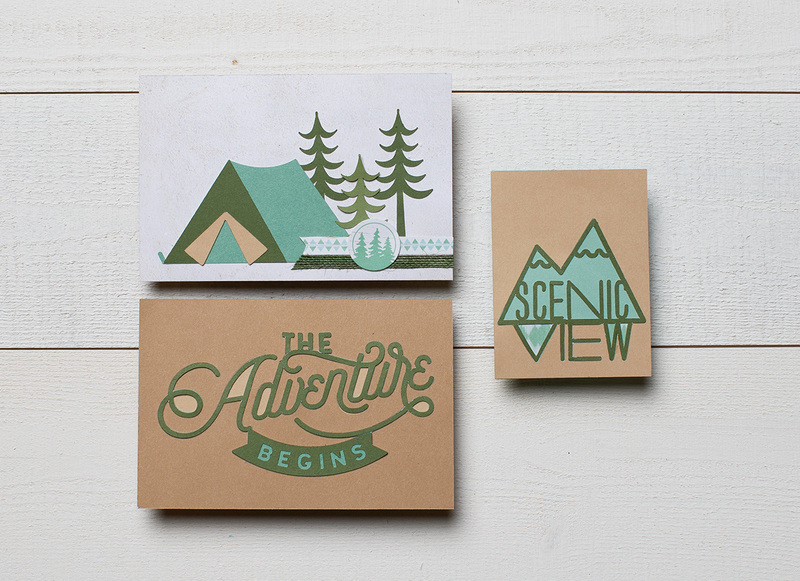 Finish it off with New England Ivy cardstock for the separate title pieces, “THE” and “BEGINS” and then “Adventure”. After your pieces are cut, it’s easy to assemble the layers for this title on your pocket card. Just remember that the final layer will be your two New England Ivy pieces, and you’ll attach them to your card over the Juniper cardstock. If you liked the title we made today but it doesn’t match your photos, that’s an easy fix. You can use the tools in Design Space to create other pocket cards in any color scheme. You’d follow the same steps and then simply choose other colors of cardstock when you cut the project. The creative options in Design Space can be used for your 12″ x 12″ scrapbook pages, but they also allow you to design projects for other types of memory keeping like pocket cards. Enjoy! LOVE this post. I love using my Cricut and with my CTMH cartridges. Maybe you could also include the Cricut Design Space link to the cut file as well? Great Step-by-Step! Pease show more of the Cricut features using the CTMH cartridges.